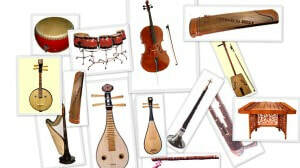 Sheng is one of the oldest Chinese musical instruments. The instrument existed as far back as 3,000 years ago. By virtue of its construction, this is the only unique Chinese musical instrument in the Chinese orchestra capable of playing up to six notes simultaneously. It is therefore commonly called as the “Chinese mouth organ” by western people. 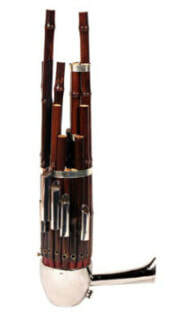 Sheng consists of 13-17 bamboo pipes with different lengths that are mounted together onto a base. Each bamboo pipe has a free reed made of brass. Music is produced by blowing and sucking the air through a metal tube connected to the base. From the base the air then rushes through the other pipes. A player determines the notes to play by allowing the air to rush through selected pipes while pressing on selected keys near the base. By covering two or more holes on various pipes, chords can be played. Its warm mellow sound expresses lyrical melodies well, while its ability to play chords makes it a highly prized accompaniment instrument.